Monaco is trailblazing again – this time with renewable energy. Within our small Principality there are already about 15 mini power plants. Now there are 16 or more and just inaugurated is the biggest right in its heart. What is intriguing about this latest development at Monte Carlo Bay is that big does not have to mean less beautiful. Not at all! And it’s especially important for a flagship SBM property. Aesthetics is one of the most important criteria for this luxury Resort which is sitting on the Mediterranean in its own beautiful peninsula. 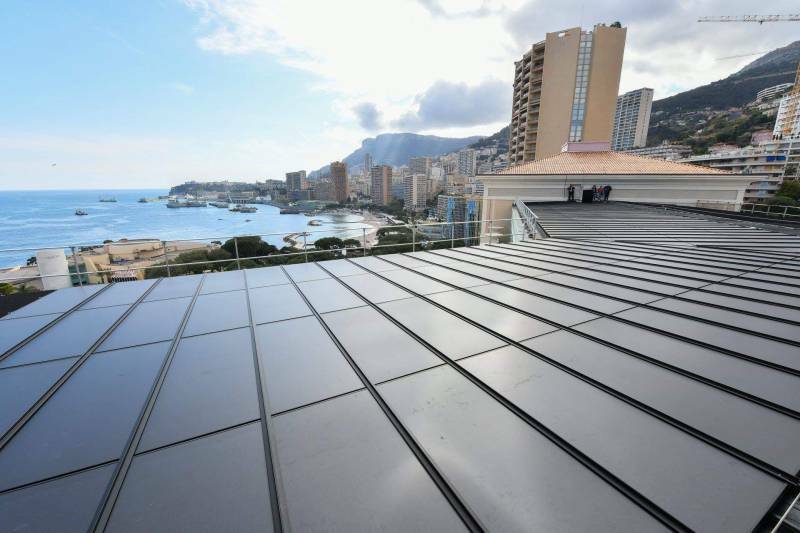 In partnership with SMEG Monte Carlo Bay is going green with this 1,000 m2 photovoltaic installation, now the largest of its kind in the Principality. It will be capable of producing locally the equivalent of the energy consumed annually by around 30 homes, or approximately 160 MWh for a capacity of 154 kWp. The solar power plant, is funded, operated and implemented by SMEG, and receives a Government grant allocated for the installation of photovoltaic panels. With good taste in design being such an important consideration – architects, including notably Gabriel Viora, had chosen 788 made-to-measure solar panels assembled on site in such a way as to offer the illusion of a classic roof. This means that while Monte Carlo Bay is converting clean energy from the sun into electricity, you probably will not notice any significant difference at all in its architecture. There is one major difference though. If this transition to renewable clean energy gathers pace – the world will be cleaner, safer and greener. The Resort Hotel has already won the “positive energy” ‘e + Trophy’ in 2017, an award which demonstrates its commitment to sustainability. Frederic Darnet, Director of the Monte-Carlo Bay, wants the hotel to continue setting an example with sustainable development. This is the latest pace-setting move in line with the Principality’s commitment to reduce greenhouse gas emissions. The hope is that a sort of race to renewables will accelerate especially with more attention being given to aesthetics which for the Principality is key. Attending the Inauguration were Marie-Pierre Gramaglia, Minister of Public Works, the Environment and Urban Development; Thomas Battaglione, Chief Executive Officer of SMEG, and Achour Daira, Technical Director of the Monte-Carlo Bay. Marie-Pierre officially unveiled the solar panel installation. The Minister said: “I urge private owners to take up SBM’s initiative and contribute, in turn, to the growth of solar power in our country. The development of solar energy in the Principality is part of a strong approach by the Prince’s Government, whose aim is to reduce greenhouse gas emissions by increasing the share of sustainable renewable energy.